Don't. That pretty much sums it up. I bought this multitool because I liked how it looked (the red version) and because it was said to be one hand tool. From the very begining Octane felt very flimsy in hand. When opening the tools it sounded like the joints were full of fine sand. The handle is made of rather thin steel so applying full force on the pliers made the whole thing bend a bit. Spacing between the handle and pliers is very loose, so there's some sideway movement (not on the pliers itself tho). The locking mechanism... well. Insert a small metallic bit in a bigger plastic bit and use a flimsy spring to work the locking part. This is the worst locking mechanism I have ever witnessed. The tools are locked firmly but the plier using the same locking mechanism is a joke. 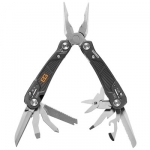 Firstly: there's no locking when the pliers are inside the handle and because of the loose spacing, the pliers tend to slip half way out when in pocket/backpack. And if you have used the pliers, one of the locks tends to stuck so you need to apply force to unlock them and slide in. This is the first multitool that has shown rust. After one damp day in the woods there were significant amount of rust inside the handle bars. And about that one hand part. Only thing that you can operate one handed is the half serrated blade. To get to the tools you have to slide the pliers out and then you can open the handles (not fully) to access the tools. 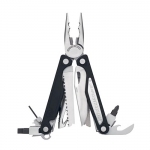 I have avoided Gerber brand after this fiasko, even the Legend 800 is one excellent multitool.